Barkhamsted is fortunate to have an active senior citizen organization. The goal of the Barkhamsted Seniors group is to provide an array of social opportunities and other benefits to residents of the area over age 55. Currently there are 129 members in the Barkhamsted Seniors, most from Barkhamsted but many from surrounding towns such as Winchester and New Hartford. Members pay dues of $5 per year. 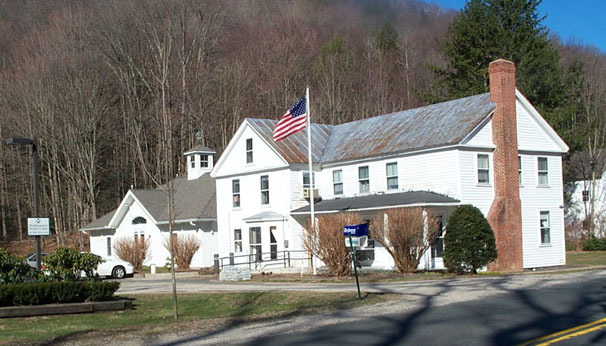 Meetings and activities are held at the Barkhamsted Senior Center on West River Road, which is about a mile north of the bridge in Pleasant Valley. This excellent facility includes a spacious assembly hall that was just completed in 2000. Photo- The Barkhamsted Senior Center on West River Road. The new assembly hall is behind (to the left) of the main building. March 2002. In addition, each month a movie is shown at the Senior Center. The scheduled movie for March was Castaway staring Tom Hanks, however it had to be postponed until April due to a snow storm (if the weather is bad enough to close school, any senior activity for that day is also canceled). During some months there may also be other programs such as special trips, health screenings and blood pressure clinics. 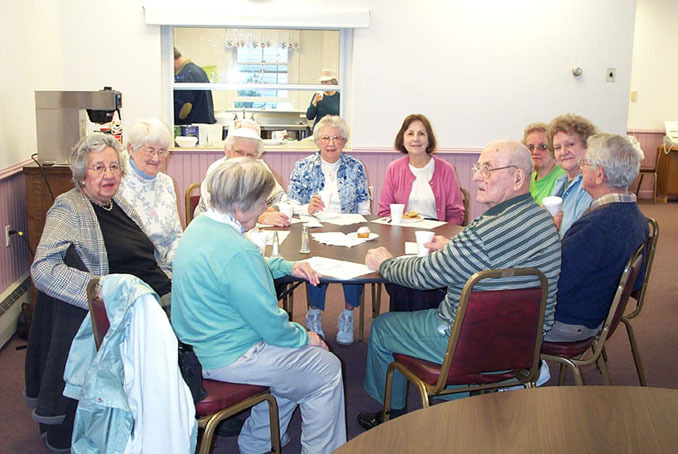 Photo- March 28, 2002, enjoying the Thursday morning continental breakfast at the Barkhamsted Senior Center. Charlie Lynes, current president of the Seniors, says that the activities are designed to be fun and to bring people together to make new acquaintances or just to chat with familiar friends. Attendance at monthly events is growing now, probably because of the new and larger facility which eliminates space problems seen previously. Mr. Lynes says that attendance is now in the 40-45 range for some of the activities.